If you’re looking for a savoury, wholesome meal that will leave you feeling full and energised, we’ve got you covered. 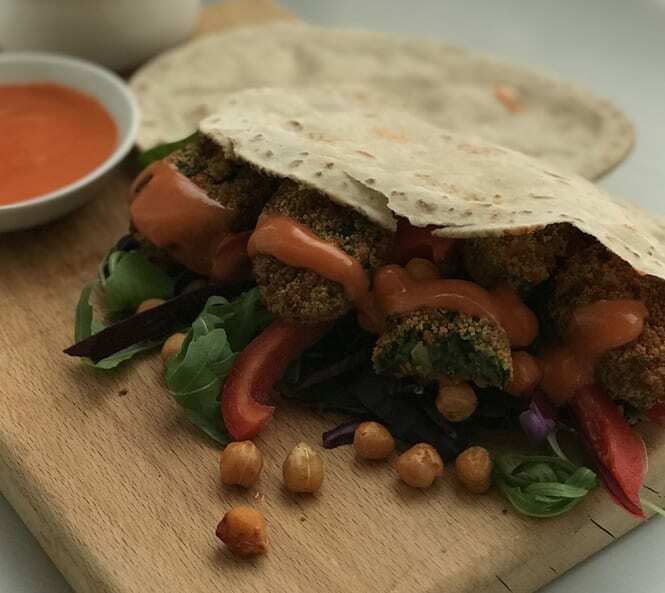 Our Spinach Bites are a perfect falafel alternative, delivering the crispy satisfaction of falafel alongside the healthy vitamin power of spinach. Stuff generously inside your favourite pitta bread and drizzle with dressing of your choice. Slice red pepper length ways. Cook Spinach Bites as per instructions on the the pack. Place chickpeas on a baking tray and season with paprika, cumin, salt and pepper. Bake for 15-20 mins until dried out and crispy. Mix the egg free mayo and Sriracha sauce. Assemble the pitta bread as desired. Drizzle the Sriracha mayo on top and dig in!